The rich and strong flavour of the Gorgonzola is perfectly balanced by the sugar and acid profile in the strawberries. A dessert that will really surprise. Preheat oven to fan 165°C. 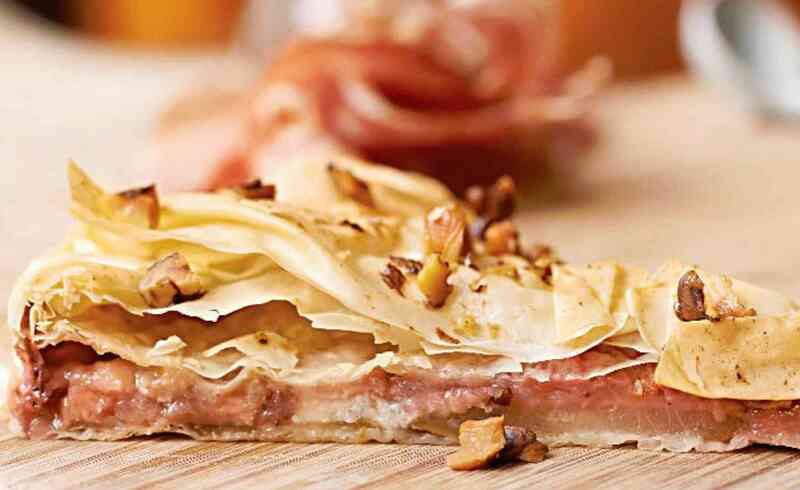 Brush a 20cm quiche or tart tin with butter, and layer over a piece of filo, allowing edges to drape over the sides. Butter this filo and place a second sheet over this, draping edges at right angles. Butter and layer a third piece of filo. Using a paring knife, slice pear into thin strips and top filo. Place a forth filo sheet over the pear and brush with butter. Carefully slice half the strawberries and place over filo. Crumble over half the gorgonzola and top with a fifth filo sheet. Butter this sheet and repeat another strawberry gorgonzola layer. Top with the final filo sheet and butter. Begin to carefully fold in all the draped edges, buttering as you go, being careful to keep the tart a nice shape. Once all the edges are folded in, brush with a final stage of melted butter and sprinkle with crushed walnuts. Bake for 55 – 60 minutes or until golden brown. Slice and serve as part of an antipasto board, with salami, bitey cheddar and dried fruits, or serve with a rocket salad as a light lunch.